CBI 1:34: | Fate colazione? In this latest episode of Coffee Break Italian, Mark and Katie have breakfast in their hotel and get chatting to one of the other guests. This lesson gives you the chance to build your vocabulary, practise the words and phrases you already know and experience a regional Italian accent. CBI 1:35 | Avete bisogno di informazioni? Join Mark and Katie as they visit the town of Stresa on Lake Maggiore. In order to find out about the town they head straight to the tourist information office and you can listen in on their conversation, practising language you’ve learned previously in the course and learning new words and phrases. When you’re travelling, one of the most common situations encountered is that you need to ask for information. In this episode of Coffee Break Italian Mark is asking for information in his hotel in Stresa. You’ll review some of the language areas already covered and learn new words and phrases through the conversation. 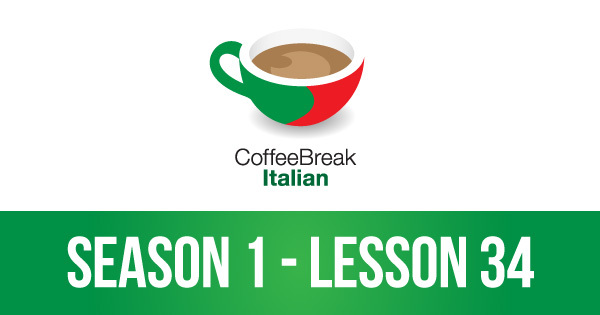 Hopefully you’ll not have to visit the doctor or the pharmacy while you’re in Italy, but in case you do, this lesson will help you prepare! Katie hasn’t been feeling too well and she visits the pharmacy in this lesson. We’ll listen in to the conversation and Mark is on hand to explain everything. CBI 1:39 | Ho l’acquolina in bocca! In this week’s episode, we’re joined by a special guest: la mamma di Francesca! Katie is drafted in to help make the tiramisù and Mark is on hand to explain everything.